Virtual private network can be configured with most of the Cisco routers( 800 to 7500 series) with IOS version 12 or higher.VPN can be implemented in a number of ways–with various level of security measures and configuration. To determine the right VPN configuration for your network, you need to have a solid understanding in cryptographic system and encryption algorithm.Besides, one needs to know which type of VPN is suitable for remote clients and which type of VPN is used to create secure site-to-site connection. This article explains the necessary steps with configuration script to setup VPN in Cisco routers. 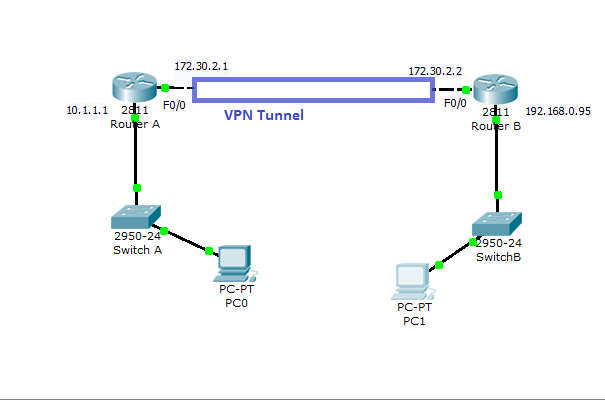 This configuration can be simulated in Cisco packet tracer software as well. Digital certificate– a way to validate the identity of the sender. Digital certificate contains the identity details of a public key holder and it is issued by a CA. When you decide to set up a VPN, you need to design a VPN implementation plan. The VPN implementation plan needs to consider the following aspects. 1. Identify the type of VPN (SSL or IPsec) you need to implement and what the computer systems or network equipments need to be protected by VPN connection. 3. Testing- it is better to try to test your design in a test environment before you deploy the VPN in your organization. 5. Monitoring- monitor the traffic activity at the VPN end points and always check out the security warnings or updates with your VPN equipment vendors. IPsec protocol is basically a combination of two different protocols with two different purposes. These two protocols are collection of security protocols are: packet protocols and service protocols. There are two major packet protocols: ESP (encapsulating security payload) and Authentication Header (AH).The service protocol of IPsec is known as IKE-Internet Key Exchange. ESP-its encrypts entire IP data portion of the packets and adds ESP header and trailer at the end of the packet.ESP provides confidentiality, authentication and integrity to a data packet. AH– authentication header adds to the IP packet to provide the data packet validation.AH does not offer any encryption service, unlike ESP. IKE-it uses Diffie Hellman key exchange process to offer key management and security association. So, as you see that IPsec mainly provides two type of service – packet authentication and encryption- by using ESP and AH. IPsec can provide these two services in two modes- tunnel modes and transport mode. Tunnel mode provides the encryption and authentication for the entire data packet, where as transport mode provides only the transport layer data security and authentication. Thus transport mode IPsec generates lower overhead and is faster than tunnel mode IPsec. The disadvantage of transport mode IPsec is the any attacker may perform traffic analysis of this packet since the header information is not encrypted. Now, you understand the basics of IPsec and let’s see how we can implement IPsec based VPN in a Cisco router. This configuration is for a site to site type VPN, where all traffic from router A to router B will be encrypted with IPsec. Now, you can configure the router B with similar configuration just by changing the peer IP, IP router and access list IP with for router A.
Glad to know that you understand it.Thank you so much for your feedback.If you have any queries, please never forget to leave your feedback.I will try to answer you to the best of my ability. i have to do a simmiler conf but with internet acces. how can i use nat to allow internet access my set up is the same on the inside but on the same link as the tunnel i need to get internet trafic out to. i cant seam to get it nat properly any ideas?